The Young Archaeologists’ Club (YAC) is the only UK-wide club for young people aged 8 to 17 who are interested in archaeology. YAC’s vision is for all young people to have the opportunity to be inspired and excited by archaeology, and to empower them to help shape its future. This is done through the national YAC website and local branches. 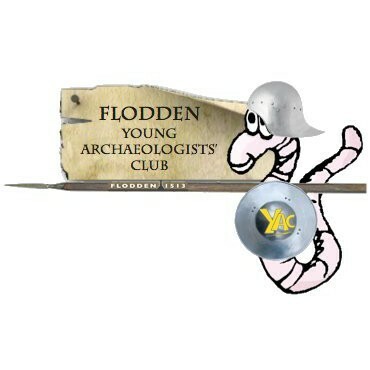 The Flodden branch of the Young Archaeologists’ Club was set up in 2014 as part of the Flodden 500 project and covers a large area stretching across north Northumberland and into the Scottish Borders. Our Young Archaeologists are given the opportunity to explore the history of the area, discover its archaeology and bring the past to life through a variety of craft activities, site visits and fieldwork. Dr David Petts and Dig Ventures on Holy Island, Dr Ben Edwards and his team from Manchester Metropolitan University at Ford’s Bronze Age henge, to name but a few... filling in our Archaeology Skills Passports as we go! The BAJR (British Archaeological Jobs and Resources) Archaeology Skills Passports are a means of documenting the practical training that our YACs and other volunteers have received during the project - covering everything from core skills such as the use of hand tools, to more complex tasks like surveying and section drawing. This widely recognised record of skills and achievements will be particularly useful to those members who go on to study archaeology. I went to Bradford Kaims, near Bamburgh three times to dig; it was fun and really interesting. The first time I went I had won a competition; the other times I went with The Flodden Young Archaeologists’ Club who were invited to dig there. Bradford Kaims is a wetlands archaeological site where a wooden ‘platform’ has been found, the wood has been incredibly preserved thanks to the once marshy land. The archaeologists at Bradford Kaims think that the wood was once a walkway or path for people moving across the wetlands. The ‘platform’ goes down several metres into the ground; it’s like this because people lay down the wood and went across and left the wood on top of the wet and muddy ground. After a period the wood sank into the marsh, the people returned later on and put more wood on top of where the old wood used to be and went across again. The wood kept sinking and they kept putting more wood over it. This meant two things; the platform was getting thicker and that the people had to keep moving for some reason. YAC got to excavate part of the burnt mounds there. The burnt mounds are piles of stones that were burnt, or had been dropped in a fire; in the piles we found bone, pottery and charcoal. Elizabeth’s photograph in the Autumn 2014 edition of ‘The Young Archaeologist’ magazineIn the more excavated part of the first trench, archaeologists had dug down further and found holes and a mysterious mark in the wood there. We think that the wood with the holes in could have been tools. We don’t think the mark has been made naturally, but made by a tool; we think this because the mark has clean edges and doesn’t look like it has been snapped. While I was there I took a ‘worm’s eye view’ picture of the mark. I entered it into the Festival of Archaeology’s photography competition and came second, winning a book.